How Was the Tutor/Mentor Connection Created? NOTE: As you read this history, you can also view concept maps that diagram the goals and strategy of the Tutor/Mentor Connection. After operating from 1993 to June 30,2011 as part of a 501-c-3 non profit the Tutor/Mentor Institute, LLC was created in July 2011 to continue to support the Tutor/Mentor Connection in Chicago and to help similar organizations grow in other cities. The history below shows how a few what a fe volunteers started in 1965 continues in 2011. View concept map showing history from 1973 to 2015. The roots of this organization extend back to 1965 when associates from the Montgomery Ward Corporate Headquarters in Chicago began to offer weekly one-on-one tutoring to elementary school youth living in the nearby Cabrini-Green public housing complex. Dan Bassill, founder of Cabrini Connections, Tutor/Mentor Connection, and the Tutor/Mentor Institute, LLC, joined Wards as an advertising writer in 1973 and became a volunteer in this program. He became its volunteer leader in 1975. 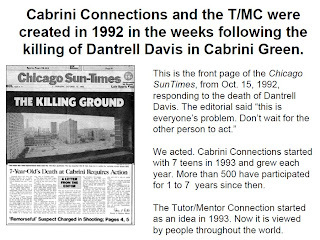 In 1990 Bassill left Wards and converted the original 2nd to 6th grade program to a non profit called Cabrini Green Tutoring Program, Inc.
Cabrini Connections, Tutor/Mentor Connection was created in aftermath of the Dantrell Davis killing in Chicago in October 1992. Davis’ death was the catalyst for a city-wide media campaign to ‘stop the killings’. The media ran feature articles profiling after school programs in the area that were working to keep children safe during non-school hours. The areas of the city most desperately in need of school reform and after school programs tend to be in the same areas plagued by poverty, violence, and segregation. Unfortunately, the media’s attention to the events and research findings was short lived and it focused on only a few neighborhoods. This was not the type of support that companies like Wards, Sears, and Walmart use to put stores near customers or to draw customers to those stores on a daily basis. Since 1993, the Cabrini Connections program has provided mentoring-to-career support for more than 700 low-income, inner-city teens living in the Cabrini-Green area of Chicago. The program now has a pipeline of youth ranging from entry-level 7th graders to college graduates who were in 7th and 8th grade when they first joined. Daniel Bassill, founder and president of Cabrini Connections, left the organization in mid 2011. The program continues under a new name: Chicago Tutoring Connection..
(a) It is possible to connect workplace volunteers and inner city kids through long-term, one-on-one mentoring, while enriching the lives of youths and adults. (b) It is incredibly difficult for small programs to consistently find the resources to sustain themselves for the long term. (c) Programs often suffer from a lack of the consistent leadership strategies necessary to ensure growth, quality, and sustainability. The founders of Cabrini Connections recognized that in order to draw the consistent resources needed to increase the effectiveness of Cabrini Connections, they needed to create a leadership organization that would assist all tutor/mentor programs throughout the Chicago area. Thus, they created the Tutor/Mentor Connection. The T/MC supports the growth of tutor/mentor programs throughout the Chicago region in a variety of innovative ways. The T/MC began building a master database of Chicago tutor/mentor programs in 1993 and has been sharing information about these programs in a variety of ways in the years since then. In 1998 the program moved to the Internet, and now shares information about Chicago programs via an interactive, map based, Program Locator. The organization supplements this information with an extensive web based library of information for volunteers, students, program leaders, and supporters. To encourage more people to look at this information and support individual programs throughout Chicago, T/MC leads an on-going advertising/PR type campaign intended to draw resources to every program in the Chicago region. Since T/MC does not have money to advertise, it seeks to recruit business, faith, and community leaders to share this message via their own communications. In addition, T/MC has organized quarterly events since 1994 such as a Tutor/Mentor Leadership and Networking Conference each May and November, and an August/September Volunteer Recruitment campaign to build visibility and draw volunteers and donors to different program and to the resources on T/MC websites. In 2005, the technology department at Indiana University/Purdue University at Indianapolis (IUPUI) donated resources to create the T/MC Online Portal, which currently connects the T/MC community interactively through discussion forums and links pages. T/MC would like to thank IUPUI for its continued support of the T/MC mission. In 2007, an anonymous donor provided $50,000 which the T/MC used in 2008 to upgrade its Chicago programs database and mapping capacity. In late 2008, the T/MC used part of this money to launch an on-line ineractive Program Locator, with maps that visitors can search to learn where tutor/mentor programs are needed and what programs operate in those areas. In 1998, The T/MC rebuilt the Tutor/Mentor Institute website where we share ideas and concepts that we have learned over the past 30 years. These resources are intended to be used by leaders in their own efforts to help inner city kids move through school and into adult lives and careers. In April 2011 the Directors of Cabrini Connections, Tutor/Mentor Connection decided that the small site-based tutor/mentor program they were leading could not continue to support the city-wide vision of the T/MC after June 30, 2011. Daniel Bassill resigned from his role as President, CEO and in late July created the Tutor/Mentor Institute, LLC in an effort to find new ways to support the T/MC strategy in Chicago while also helping similar strategies grow in other cities. That strategy continues. As we move into the next few years Dan seeks to find leaders in Chicago or other communities who would bring the Tutor/Mentor Institute into a college, or a different structure, where new leaders can build on the work done in the past, with greater impact and affect into the future. How do we measure the success of the T/MC? One measure of success is that these resources are still available (and FREE) to people in Chicago and other cities 22 years after launching the T/MC in 1993. No major donors have provided consistent support during these years, and some donors who did provide significant support such as the Montgomery Ward Corporation, have gone out of business due to changes in the marketplace. Much of the work of creating the T/MC has been done by volunteers who have donated their time. Many of these individuals started as tutors/mentors at Cabrini Connections. Another measure of success is the many ways that T/MC has been recognized for its leadership and service. In 1997, T/MC exhibited at the Presidents' Summit for America's Future. From 2001 through September 2009, T/MC President Daniel F. Bassill served as a Commissioner for the Illinois Commission on Volunteerism and Community Service. The Associated Colleges of Illinois also named Bassill a 2004 Outstanding Example of Liberal Arts Leadership. In 2008 Bank of America recognized Bassill with a community leadership award. A complete list of awards can be found at this link. When the T/MC was launched in 1993 our first goal was to create a master database of volunteer-based tutor/mentor programs. We've done that and we continue to maintain this information annually and now share it in a searchable, map-based Tutor/Mentor Program Locator. We took this strategy to the Internet in 1998 and since then more than 1.5 million visitors have been recorded on our web sites. If you search GOOGLE for the words "tutor mentor" the T/MC web sites come up on the first page (many times!). This means our Internet strategy is making this website a destination for people throughout the Chicago region and the rest of the world. The T/MC did this working with less than $125,000 per year! The Tutor/Mentor Institute, LLC has continued to support this strategy, operating at less than $10,000 a year since 2013. This comparison of the Chicago T/MC with mentoring partnerships in other cities and states shows that while we serve one of the largest regional populations we have had far less money per year to do this work. This is why we no longer are able to operate a single tutor/mentor program while trying to support a citywide-strategy. It's also why we've created a Tutor/Mentor Institute, LLC social benefit corporation to try to generate new streams of revenue and partnership to support this effort. * connect on Twitter, Facebook, Linkedin and other on-line forums.